This is the final unit in the tecnical indicator module of the course. Today we will look at the Parabolic SAR indicator. This will help you determine when to enter and exit the market, once you find a trend. You already know from the RSI unit that J Welles Wilder created this parabolic SAR indicator. This article will be fairly short, because it is a simple indicator. The parabolic SAR indicator is plotted directly on the price chart instead of below it. The basic idea is that when the indicator is below price you should be long. When the indicator is above price, you should be short. You use the indicator to decide how to ‘trail’ your stop loss. So for example, if you are short, you use the indicator to decide how to trail your stop loss down. The general strategy is to trail to stop up or down with each consecutive dot that forms. Be aware that the indicator does not work well at all in a ranging market! Be aware that this indicator is difficult to trade with on its own! If you do decide to trade with parabolic SAR in a range, you will likely get whipsawed with trades hitting your stop loss. So trading it all the time will not be very profitable. The developer of the indicator says you can use it to enter trades. But he recommends using it for the placement of trailing stops. 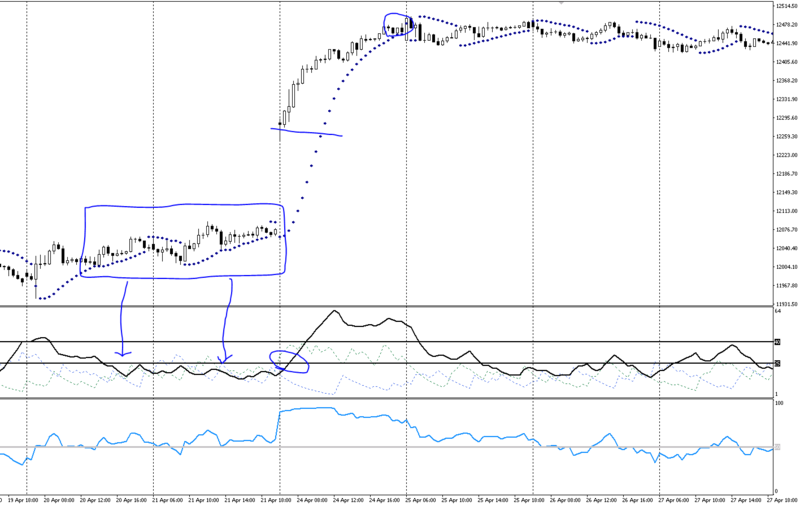 This indicator works well with other indicators such as the ADX. James J Wells Wilder is responsible for this one too. So to summarise, you would do well to identify your trend, then decide an entry. Once you have your position, use a trailing stop with the parabolic SAR indicator. Once the price passed the indicator, you have can exit the trade. As we won’t use parabolic SAR to trade alone, it means we need some help. So let’s take three indicators; RSI, ADX and parabolic SAR. You should already know about these other two indicators. So take a look at the rectangular box around price on the left. Combine that with the ADX. What does it say? For me, it says price is choppy, no trend. We have resistance about and ADX is low. However on RSI, bullish strength is building. When ADX breaks above the line, we also have a break of resistance at the same time. A couple of different technical tools agree and as a result a trend forms. Therefore we can enter a trade. (Hindsight is 20/20). Once we open the trade, we can start to move the stop loss up in line with the parabolic SAR indicator. Eventually price will hit the stop loss. This is the circle at the top. This is a basic example of using multiple indicators to find opportunities to trade. The key part of that exercise is to find confirmation there this may be a good place to trade.